Nor'easter who? Welcome to the perfect answer to yet another week of temperatures below 65 degrees: a salon! Salon No. 6 to be exact. We'd like to think Novella will be the harbinger of springtime joy so scroll down for the prompt we'll be writing on this April, where you'll find us, and how to share your piece with us all next month. Sarah Breedlove, known as hair-care entrepreneur Madam C.J. 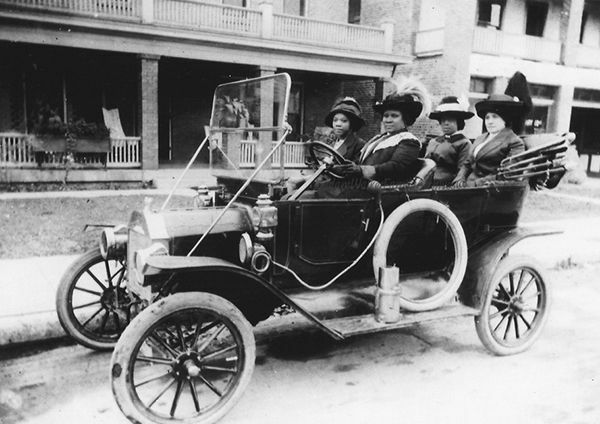 Walker, driving her car in 1916. One of America's first self-made female millionaires. This April, we are gathering at Lou & Grey once again to think around the theme "rich". As always, we invite you to respond to the prompt literally and figuratively: from the feeling of getting your first paycheck to the impact an international trip had on your worldview to the passed-down recipe of your family's sauce. We want to know: what does "rich" mean to you? Out of town? Not in NYC? Don't forget to join Women of Novella, our Facebook community for writerly women everywhere. What: Join us for our sixth salon as we convene in the super-cozy Lou & Grey Flatiron store. We’ll eat, drink, listen, and share, wrapping up with a reading by our Selected Speaker (email your piece to hello@novella.nyc for consideration) and a brief Q&A. Sips and snacks will return, provided courtesy of our favorites at Winc (try their wines out with our special code NOVELLA) & Dig Inn. *If you’d like to be considered for a Selected Speaker spot, please RSVP via the link above and email us your prompt response at hello@novella.nyc by Friday, March 29, 5PM EST. All attendees should RSVP by Monday, April 2, 11:59PM EST, and arrive with a printout of your work for peer-to-peer discussion. See you on April 3 & don't miss our Writing Workshop on April 7!